Mosquito Control Woodstock, GA | Bug-Off Exterminators, Inc. Choosing us means you choose the services of trained, registered professionals. Every one of our pest control technicians is out in the field on a daily basis treating client's homes and properties in Woodstock, Georgia. We're experts at providing accurate and effective treatments for a variety of homes and businesses. You can expect long-lasting protection from bugs with the product our technicians apply to your yard and shrubbery. The installation of traps provides a breeding spot for female mosquitoes that will exterminate the eggs and larvae. They'll be gone and stay gone until your next appointment. The warm season is a time for being outdoors barbecuing, playing, and watching the sunset. Yet, it is also an active time for mosquitoes and other biting insects. If you have a problem with these flying pests, Bug-Off in Woodstock can help by using mosquito control treatments. With regular service visits, we can keep the mosquito population under control on your property. Our technicians have the right equipment and treatments that target these nuisance pests. You won't have to spend any more evenings slapping at mosquitoes and you won't have to remember to apply the bug spray before heading outside. 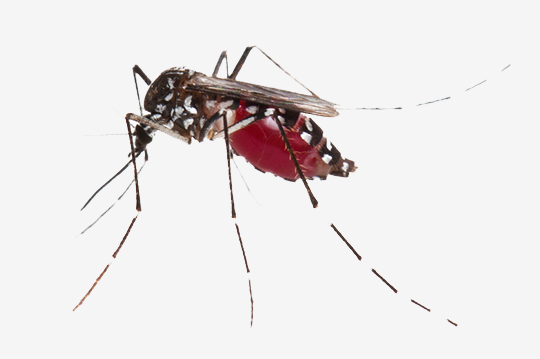 It may be tempting to skip the mosquito treatments, especially if you don't live near water. However, these winged insects fly in from all over and the females like to take advantage of any water source. They lay eggs in ponds, rivers, streams, puddles, and even potted plants! You can prevent any future hatchings with our residual pesticide and trap installation. During an appointment, our technician is happy to explain what kind of treatment will be used. We use a better-quality pesticide that offers long-lasting results in mosquito control. The technician wears a backpack sprayer with an attachment similar to a leaf blower. 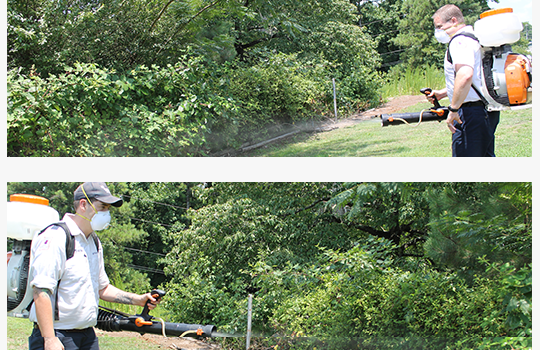 The sprayer is used to apply pesticide to all of your shrubbery or bushes where mosquitoes tend to congregate. This product is safe for your plants and, we do not apply it directly on your grass. By installing the mosquito traps we create a breeding spot that will exterminate the next generation of mosquitoes. The trap will continue to work between services and in the rain. Our pesticide kills mosquitoes for several weeks, but does eventually break down from exposure to the elements. This is why we recommend a monthly service visit to ensure that the last treatment is still working when the next treatment is applied. Regular appointments mean that you'll never have a gap period where the mosquitoes start being active again. We know customers love the freedom to roam on their property that our mosquito treatments provide. Don't hideaway during the summer and fall months. Give us a call to come treat your property and save you from unpleasant bug bites.